Acting EPA chief Andrew Wheeler yesterday fired a panel of scientific experts charged with assisting the agency's latest review of air quality standards for particulate matter. He also scrapped plans to form a similar advisory panel to aid in a recently launched assessment of the ground-level ozone limits. Those steps, coupled with Wheeler's previously announced decision to concentrate authority in a seven-member committee made up mostly of his appointees, quickly sparked objections that the agency is intent on skewing the outcome of those reviews in favor of industry. "I think they are trying to rush through a process that will provide a result that is driven by political science, not health science," said Paul Billings, senior vice president for public policy at the American Lung Association. Under the Clean Air Act, EPA is supposed to review the adequacy of the standards for particulate matter, ozone and four other common pollutants every five years with help from outside experts. While the seven-member committee, officially known as the Clean Air Scientific Advisory Committee (CASAC), has the lead in the process, the review panels are supposed to provide additional know-how in assessing the relevant scientific literature, which can span a variety of academic disciplines. For the panel's some two dozen members, most of whom are university researchers, news of their dismissal came late yesterday in an email from an EPA staffer who said Wheeler had tasked the CASAC with serving "as the body to review key science assessments for the ongoing review of the particulate matter" standards. "Therefore the CASAC PM Review Panel will no longer be involved with the agency's ... review and your service on the panel has concluded," wrote the staffer, Khanna Johnston. In a separate message, Johnston similarly told applicants for membership on the ozone review panel that the agency would not be proceeding with its creation. "I guess I'm disappointed," said Barbara Turpin, head of the environmental sciences and engineering department at the University of North Carolina, Chapel Hill. Turpin had been on the particulate matter review panel. Her colleagues there were among the best in their fields, Turpin said in an interview this morning. "In a sense, we serve as a check that the EPA is following the requirements of the Clean Air Act." Jeremy Sarnat, another former member of the panel, who is an associate professor of environmental health at Emory University, called the move "depressing." 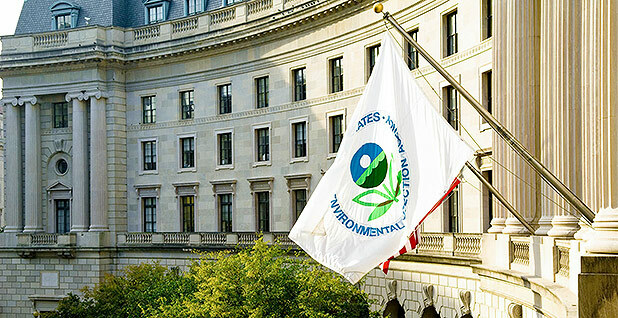 "What the new and previous EPA administrators have done is dismantle a process which has, over many years, proven itself to be highly-successful and effective," Sarnat said in an email. The new process, he added, now consolidates input "to a small, and in some cases unqualified, group of individuals, and ultimately opens EPA up to the charge that it is politics, not science, that is driving this new policy." Review panel members were considered "special government employees." 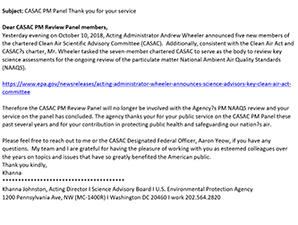 Asked why EPA scrapped the panel, agency spokesman John Konkus pointed to Wheeler's decision to concentrate more authority in the seven-member CASAC. He did not reply to an email this morning seeking comment on the criticism from Billings and others. Earlier this week, Wheeler announced five new appointees to CASAC, the bulk of whom come from state and local regulatory agencies, not academia. Tony Cox, the committee's chairman, is a Colorado consultant who had done work for the oil industry. Earlier this year, Cox told E&E News that he has also served as an expert in risk analysis for EPA and the World Health Organization, and had not made a decision on whether the particulate matter thresholds need revision. But under a timetable imposed by former EPA Administrator Scott Pruitt, the agency now plans to complete the review of the particulate matter standards by late 2020, or about two years ahead of the original schedule (Greenwire, May 10). The new review of the ozone standards, which has barely begun, is also set to wrap up around the same time. As a reason for the fast-track approach, Pruitt and EPA air chief Bill Wehrum have pointed to the Clean Air Act's requirement that the reviews be done every five years, a goal that in the past the agency has rarely met. But the disbanding of the particulate matter review panel comes as EPA's Office of Research and Development is set to soon release a draft summary of the scientific research to be used in deciding whether the existing standards need to be changed. Andrew Rosenberg, who heads the Center for Science and Democracy at the Union of Concerned Scientists, said he sees the two events as directly connected. He said that in light of evidence that the current limits on fine particulate exposure are not strong enough to adequately protect public health, "I'm really worried about [what EPA is] going to say." Both ozone and particulate matter are closely connected to production or consumption of fossil fuels. Wheeler, before joining EPA, was a lobbyist whose clients included Murray Energy Corp. The Ohio-based coal giant was a strident critic of Obama-era environmental regulations; CEO Bob Murray is a prominent supporter of President Trump. Murray has had no contact with Wheeler since the latter was sworn in as EPA deputy administrator in April, company spokesman Cody Nett said this morning. Asked whether the firm has a position on Wheeler's decision to disband the particulate matter review panel, Nett declined to comment.